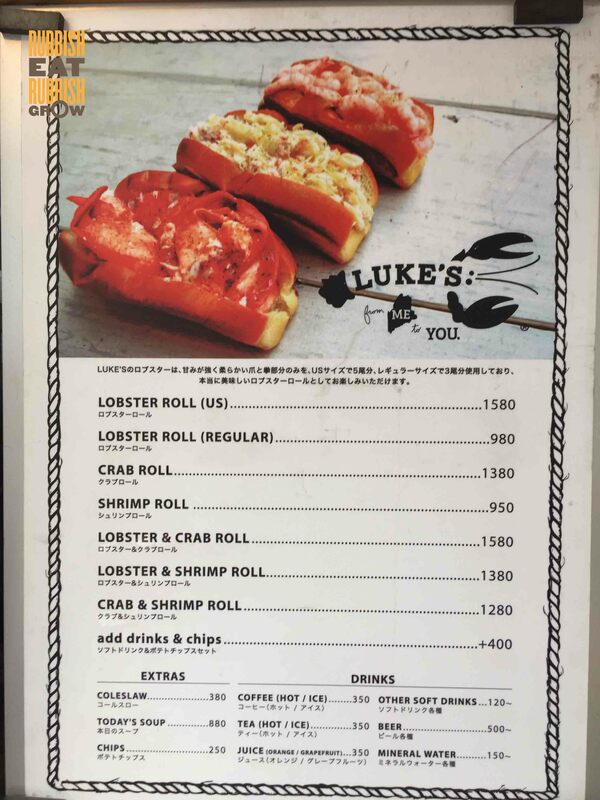 There are 6 outlets of Luke’s Lobster in Japan; Osaka, Kobe, and Kanagawa Prefecture have one stall each, and you can find 3 in Tokyo. In Tokyo, the outlets are at Hiro-0, Shibuya, and Harajuku. The Shibuya and Harajuku outlets are near to each other. We went to the one at Harajuku, which is near to Meiji Jinggu shrine, a huge tourist attraction. Oddly, Luke’s Lobster did not originate from Japan. It was founded in New York, USA, in 2009, getting its sustainable, traceable seafood supply from Maine, a portside area known for their fresh seafood. On the day we were there, the lobsters were from two Maine harbors called Portland and Friendship. In Tokyo, they operate as takeaway shops although there are a few tables and chairs. People were considerate enough not to hog the seats, and people in the queue didn’t chope the seats. They queued, they ordered, and then they searched for seats. There should be enough seats because it is a eat-and-go place, so don’t be kiasu and reserve seats before purchase. When we were there at about 1pm on a weekend, there was a long queue but it moved quickly, taking about an hour. Many people in the queue were tourists, and there were many Singaporeans. Initially, I wanted to order the set (with drinks and chips, additional ¥400). Although the cashier could not speak English well, she made it clear to me (in a polite and amicable manner) that it was cheaper if I ordered a soft drink and chips individually as a la carte. In any case, she showed me that the chips are Kettle potato chips and not french fries, and I definitely did not want anything from a packet. That’s great service. So we ordered a roll each at ¥1580. This is about Singapore $19.50, which is rather affordable, and which may explain the queue. My advice is: each person should just order 2 rolls because 1 roll isn’t filling and you already queue so long for it. How was the food? It was alright. I appreciated that it wasn’t drowning in mayo. Oftentimes lobster rolls err on so much mayo that the lobster loses it taste. But in the end, it’s only lobster tossed in a light sauce, and I thought it was vinegary for me. It was a good, clean, fresh lobster roll, but there was no magic. I don’t think it is worth the wait for something that is not shiok enough. I’d rather eat at Platypus Lobster Shack in Singapore, which costs the same price without queuing, and you get a comfortable seat. Given the power to turn back time, I certainly won’t queue. 15 minutes maybe, but not for an hour. We spent ¥3280 for two persons.